Virginia Diner classics are always a hit for tasteful gifts, or to have on hand for your own snacking pleasure and everyday entertaining. Our top selling Salted Gourmet Virginia Peanuts in 10 oz. vacuum-packed tin. I am very happy with the peanuts. We received a gift package at Christmas with Lightly salted peanuts. I did not see them on the list. Do you carry Lightly Salted Peanuts. Owner Response: Our salted peanuts are the "lightly salted". We got away from saying that because, "Light" implies calories or fat content to some people. Be assured the salt is the same, and are American Heart Association certified as a heart healthy snack. 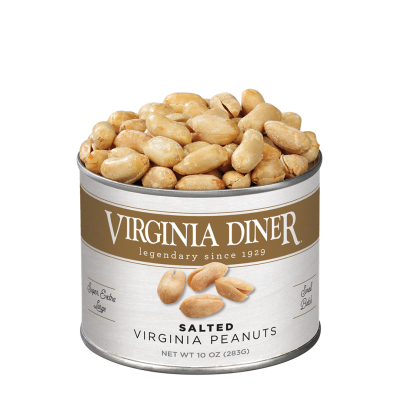 These are the best Virginia peanuts. The one and only Virginia Diner. 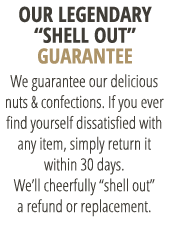 I have been buying your peanuts for years and by far the best the world has to offer. These are the best nuts! Crunchy with just enough salt. They are not over processed like the store brand types. I really enjoyed my purchase and the way it was packaged with the brochure. These peanuts are a very good source of protein. Everyone should enjoy some on a daily basis. I love the taste and texture of VA peanuts. I share them with my friends from GA.
Great taste. VERY GOOD. Too many broken or half nuts per can keeps me from giving 5 Stars. I love your products. The pecan clusters are my favorite!